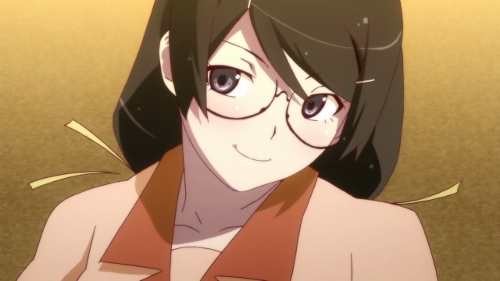 Rubenerd: #Anime Bakemonogatari 11, finally! 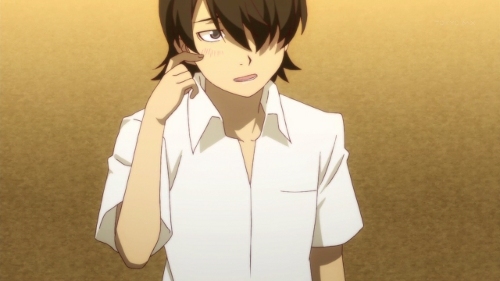 Despite the internet only being down at our home for a relatively short period of time, it managed to get me completely out of sync with Bakemonogatari Ghost Storyness. Episode 12 is already out, and I only just finished with episode 11! We've got a new story arc, this time in the form of Tsubasa Cat which I gathered from the title meant it would be about… Tsubasa. My powers of deduction turned out to be formidable (I always misspell that word), because it turned out most of the episode did centre around her. Genius! It's like I used to say to people in high school, why choose between intelligence, integrity and modesty when you could get all three in me? It seems my wit hasn't developed much at all since then. Before we got to see our favourite meganekko Class President to End All Class Presidents though in the first deviation from the regular Bakemonogatari story arc format we've come to expect we spent some more time with Nadeko from Nadeko Snake who's now free of the serpent oddities. Snakes are serpents, right? They talk about the supernatural after school and she gives the bloomers and swimwear Suruga had lent her to him for him to return, a real test for a nerdy otaku guy apparently, even if he is a former vampire -___-. She thanks him for all his help but is scared and bolts once she sees Tsubasa. She has that effect on people it seems ^^;. Before that encounter, Tsubasa and Koyomi are walking and talking about family life. Tsubasa has a bandage on her face and I think it's safe to say we all figured out why, just not whom. Turns out she was adopted and her latest step dad lashed out which she defends but Koyomi isn't convinced. Given the fact he seems determined to solve everyone's problems I was almost expecting him to walk into Tsubaya's house and return the favour for her! After the impossibly cute Nadeko scatters, the impossibly cute Tsubasa and Koyomi get back to talking. In a second deviation from the regular Bakemonogatari story arc format we've come to expect (did I just unwittingly copy that line verbatim from the third paragraph?) a previous story is introduced in order to establish background. I haven't read any of the Bakemonogatari novels, but if I were to theorise I'd say it could almost have been a separate story that the anime adaptors slipped into this one. I'm probably completely wrong, and it wouldn't be the first time. It seems even Nadeko has had troubles with oddities, in this case though its not one that attacks her like a snake or morphs her arm like a zombified monkey, but rather changes her completely into… a cat. A nekomimi Tsubasa! The back story regarding Golden Week establishes that Koyomi had once before seen her morph into a blazingly white cat after she'd buried a dead feline friend they'd stumbled across. I can't say stumbled upon because a certain website has wrecked the term for me! Anyway it turns out the way in which she was able to return to some resemblance of normality after becoming nekomimi, I'm sorry possessed, was to have her excessive energy sapped by… Shinobu! Interesting how there are millions of people in Japan and yet these crafty convenient coincidences coincide to… sorry, I was trying to think of more words that begin with C to keep the fancy alliteration up. So of course we're left with a few questions. Was Tsubasa's sudden headache (password!) merely the result of stress, or will her new stress be enough to induce a state of catlike readiness (thank you Marge Simpson) again? Was the energy sapping permanent, or will Koyomi have to go back to Epic Hawaiian Shirt guy to get this sorted out again? Will Nadeko and her awesome hair make another appearance? Will Hitagi aka Senjoughara aka Her Senjougharaness make any appearance at all!? 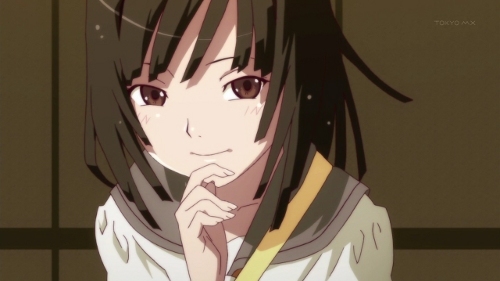 As I've already said, this episode was definitely different from the regular Bakemonogatari story arc format we've come to expect (ah crap, three times) in that it followed on from a previous arc when others were fairly self contained, and that it needed more of a back story to be established. Oh yeah, and this shot was the best of the entire episode. 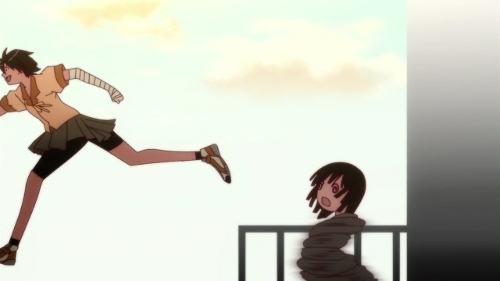 Suruga is fast, and Nadeko's expression is priceless! Newer post ← Welcome Google Reader readers!